The newest in E P Armory innovation. This Kevlar reinforced polymer is able to take GLOCK magazines and run pistol calibers 9mm or 40S&W. The EP80-G has steel inserts for ejector pin and extraction rigidity. We also expanded our design to handle the recoil that blow back operation has opposed to DI rifles. Be sure to know your rifle/Pistol and run E P Armory quality components in correct placement will ensure a lasting enjoyment of the build. Whether your waning to make a AR pistol, AR rifle or the perfect truck gun we have you covered. 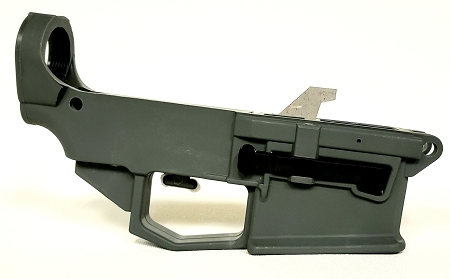 You will need to purchase a glock style magazine release (NOT INCLUDED) component, stock or pistol buffer tube setup, Lower parts kit to complete this lower. Blow back operation does cause severe recoil opposed to standard AR gas system. You must use a 5.6oz or higher buffer to maintain a manufacturers warranty for breaking. Don't use cheap parts and expect luxury operation. Machine the pocket and holes for installation of the LPK. Test fit all components of the LPK for proper function. Align the extractor in place and draw line on extractor. Remove the extractor and align on side for the holes to be marked by sharpie or pen. Drill small 3/32 holes for pin installation. Apply epoxy, install the extractor and install pins through the extractor. Allow curing time. Depending on the BCG used for the build some fitting may be needed. Now that a few manufacturers have multiple bolts on the market you need to plan for some more possible fine tuning. There are Glock BCG's, Colt BCG's, HK BCG's and combo BCG's. The Glock bolts if a true fit should work with minimal if any fine tuning. All others may need some fitment to clear the carrier grooves and or mag lip.